Chinese New Year is around the corner, Lane Crawford is celebrating this festival with “Gold Pop”, its refreshingly modern take on the most alluring and auspicious shade of the season. Lane Crawford has also collaborated with the emerging Chinese typographer, Cai Peng, to create three unique designs of femme-glam temporary tattoos, produced by Luxe Tats. From now until February 24, 2015, complimentary “Luxe Tats” tattoo services is offered with all in store purchases of beauty products from Lane Crawford Beauty. Online customers can also receive a set of these luxury tattoos with any beauty purchases during this period. 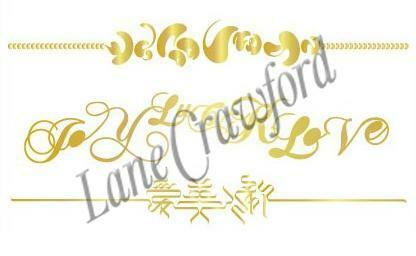 Lane Crawford wishes you a prosperous Year of the Goat with the Lucky Gold Instant Win promotion. From February 12 to 24, 2015, receive a Lucky Gold packet with single net purchase of HKD 3,800 or above to reveal prizes of shopping vouchers and gift cards of up to HKD 5,000. Everyone is a winner. Shop now at Lane Crawford stores or lanecrawford.com, to enjoy same-day delivery, and celebrate the Lunar New Year with golden joy and luxurious love. Lane Crawford proudly presents Nicola Formichetti’s first full Nicopanda ready-to-wear collection. The acclaimed designer also collaborated with Lane Crawford to create a worldwide exclusive Silver capsule collection dedicated to the Lane Crawford customer, which is available at Lane Crawford stores and lanecrawford.com alongside the Nicopanda collection. Best known as the artistic director for Diesel and frequent collaborator with Lady Gaga, Nicola Formichetti extended the original Nicopanda range into its first full unisex ready-to-wear collection this season. Key pieces in the collection include bomber jackets crafted in organza and embellished with ruffles; sweatpants, tees, and a neoprene zip jacket adorned with bows; and a black hoodie layered with tulle and mesh. Almost every piece of the Nicopanda collection has been conceived as a unisex garment, primed for an audience unconcerned with traditional gender stereotypes. An exclusive Nicopanda family figurine collection can also be purchased from selected Lane Crawford stores (price from HKD 2,000 to HKD 5,000). Lane Crawford is bringing in NLST, a new contemporary brand, to refresh your wardrobe! Designed by the team behind denim and leather label R13, NLST offers utilitarian basics with a distinctive military twist. The Lane Crawford buyers particularly love NLST’s innovative take on proportions and silhouettes. The entire NLST collection is crafted with Japanese fabric and detailed with army-style stitching, reinforcing the brand’s essence – perfect blend of quality, innovation and authenticity – designed for simple yet sophisticated men. Get your military-inspired outfit at Lane Crawford stores! With Spring around the corner, it’s time to update your wardrobe with the lightweight style of sheer outfits as seen on the SS15 runways of brands such as Erdem, Chictopia and Ms Min. Sheer clothing adds stylish seductive layers to spice up monochromatic outfits. Be bold and add some sensuality to your spring looks, while shopping at Lane Crawford stores and lanecrawford.com. After the many Christmas and New Year celebrations and parties, it is time to finally wind down and relax! Your days will surely be brightened up with these Silken Favours cushions and Kristjana S. Williams’ cotton pouffe. While offering coziness, they also inject lively energy into your home. Visit any of our Lane Crawford stores or lanecrawford.com now and get yourself equipped for a restful weekend!